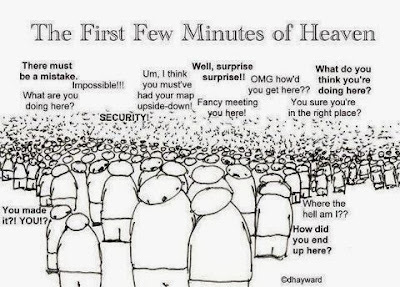 Ibo et Non Redibo: How Many People Will Get to Heaven? How Many People Will Get to Heaven? This is a question one often hears in ministry. There is nobody on earth who knows the answer. But we do know that we are all destined for heaven. At the same time, one’s salvation is not automatic. We need to attend to it daily, for it will depend on the state of my soul at the moment of death, whether it be in a state of friendship with God (state of grace). As Jesus said, “He who endures to the end will be saved” (Matt 24:13). Perhaps the best understanding of personal salvation is this: I am saved, I am being saved, and I hope to be saved. Salvation is a past event since, “because of his great love for us, God, who is rich in mercy, made us alive with Christ even when we were dead in transgressions—it is by grace you have been saved” (Eph. 2:4-5). It is an ongoing activity, since we are exhorted to “continue to work out our salvation with fear and trembling, for it is God who works in you to will and to act according to his good purpose” (Phil. 2:12-13). Salvation is also a future event, for, as St. Paul says: “the hour has come for you to wake up from your slumber, because our salvation is nearer now than when we first believed” (Rom. 13:11). In other words, salvation is a process that begins when one first becomes a Christian, continues for the rest of one’s life, and is completed when we stand before God in judgment. While the media blissfully reduced this to the notion that “faith in God is now optional”, Francis was simply repeating what well-informed Christians have always believed: Christ’s death and resurrection was the redemption of the whole world. The redemption is not the same thing as salvation, however. For the latter, one still needs the grace of God and to freely embrace it. We can hope that all people will be saved, although we cannot hold it as a definitive fact, since souls are free to accept or reject God. The final numbers? They are known to God alone. Excellent read, John. Thank you!